Fire Adapted Communities adapt to the unique needs of the local community. KFACC strives for Coalition membership that represents all parts of the community: residents, businesses, policy-makers, land managers, non-profits and emergency responders, as well as local, state and federal agencies. KFACC has elected members that serve as leadership for the group and receives support from local organizations to continue serving the mission of fire adapted and community resiliency. All of Kittitas County, community members, public land managers and other stakeholders share the wildfire risk. KFACC acknowledges the risk and is the local grassroots movement to live proactively with wildfire: before, during and after. 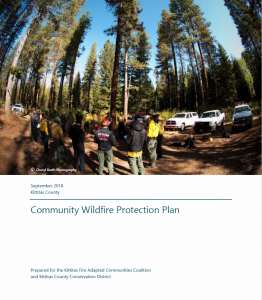 It is an important component of Fire Adapted Communities that wildland urban interface neighborhoods and communities do their part by developing a Community Wildfire Protection Plan (CWPP). A CWPP is a comprehensive plan developed by local citizens and state and federal agencies. These protection plans are based on the needs of the people in the community and can address issues such as wildfire response, hazard mitigation, community preparedness, structure protection or all of the above. Kittitas County adopted CWPP update in September 2018. This effort was led by Kittitas County Conservation District, Kittitas Fire Adapted Communities Coalition, with funding from Kittitas County Public Works as part of the Hazard Mitigation Update and Kittitas County Sheriff’s office Emergency Management Division. Like other recent fires, the Jolly Mountain Fire in the summer of 2017 brought home the true nature of our landscape in Kittitas County. We are a fire environment, as is the entire east slopes of the Cascade Mountains. 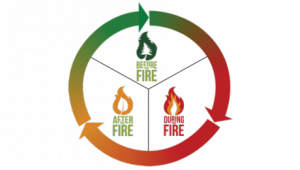 Fire is a natural part of the ecosystem and something that can and does occur on a regular basis. Landowners and homeowners who live in this environment should be aware of the risks, understand how to lessen their risks to become more resilient, and learn about resources available to them. Many people see the large flame fronts on the news and figure that’s what burned the homes. However, most homes are not destroyed by these huge walls of flames, but by the little embers. Wildfire embers can travel over a mile and you can control what happens when they land by employing effective defensible space. Building effective defensible space is not only the most effective action you can do on your property, but also provides additional safety to the first response crews during an emergency. Kittitas County Conservation District provides financial, education and technical assistance for residents of Kittitas County and cities of Cle Elum and Roslyn. KCCD offers individual and community firewise assessments free of charge. Visit here for more information. Kittitas County Chapter of the Washington Farm Forestry Association is an organization for forest land owners in Washington State. Forestry professionals and interested individuals who do not own forest land are welcome to join as Associate members. WFFA mission is to empower citizen ownership and stewardship of private forest land. Washington Fire Adapted Communities Learning Network – Communities in Action! NFPA Firewise USA Recognition Program – Become a nationally recognized Firewise community! Check the eligibility requirements here. If you still have questions, contact Kittitas County Conservation District to assist you. Kittitas Valley Fire & Rescue serves the Kittitas valley and cities of Ellensburg and Kittitas. Visit KVFR here. Kittitas County Fire & Rescue #7 covers 126 square miles of upper Kittitas County and serves approximately 4,551 residents. Visit KCFD#7 here. Learn more about Industrial Fire Protection Levels and burn restrictions regulated by Washington State DNR. If you are within a fire district, contact your local fire district for current burn restrictions and regulations or Kittitas County Fire Marshal’s office at 509-962-7506 to find your fire district information (only applicable to Kittitas County residents! ).